When you write the history of Canada in the 60s, it will be written with Ted Grant photographs. — Joan Schwartz of Queen’s’ University. 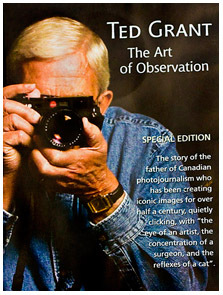 I was recently at a screening of The Art of Observation, a documentary on the life and work of Ted Grant, known at the father of Canadian photojournalism. It was written, co-produced, and co-directed by Heather MacAndrew for Bravo Canada. Mr. Grant and Ms. MacAndrew graciously gave up a beautiful Sunday morning to be with 150 personal historians at the closing session of our annual conference in Victoria, B.C. and answer questions about their work and the film. The film is rich on many levels, but I feature it here as an example of a beautifully done personal history: artistically presenting the intersection of an individual’s life and career with the powerful historic forces of his time and place. The production values are outstanding. [Yeah, yeah, I know. Most of us do not have the budget of a major national network behind us.] Nonetheless, there is a great deal we can learn by studying the lighting, the voice-overs, the editing. Good creative and technical decisions don’t cost money, but they do require a mastery of the craft. But even more important than production quality [and I do think that is a very important part of the work we do as professional story tellers] is to see what a strong story Ms. MacAndrew has shaped. Yes, she is telling the story of the man who defined Canadian photojournalism and influenced the profession all over the world. And she is surely aware that this story will become part of an important historical record, catalogued into university and archive center collections. But she is also telling the story of an ordinary man. A son and a husband. A father and a grandfather. A teacher, a citizen, a neighbor. This is the work we do as personal historians. We draw out and record a person’s life: looking for the distinctive gestures and vocal inflections, the small details, the meaningful objects, the story that wants to be told. And then we present it in the most artful way we can as a gift to the future. If you are interested in photography, filmmaking, personal history, 20th century history, or Canadian history, I encourage you to get the film. [Lots of great bonus tracks as well.] Watch it more than once. Deconstruct it. Integrate it into your own personal history storytelling, regardless of the medium you work in. And do what you can to get Ted Grant: The Art of Observation into wider distribution. This entry was written by cj-madigan, posted on November 16, 2010 at 4:34 pm, filed under Book Thinking, Personal History, Photos, Uncategorized. Bookmark the permalink. Follow any comments here with the RSS feed for this post. Both comments and trackbacks are currently closed. . View the archives for more.